For other people named Marcus Allen, see Marcus Allen (disambiguation). Marcus LeMarr Allen (born March 26, 1960) is a former American football running back and football analyst for CBS. As a professional, Allen ran for 12,243 yards and caught 587 passes for 5,412 yards during his career for both the Los Angeles Raiders and the Kansas City Chiefs from 1982 to 1997. He scored 145 touchdowns, including a then-league-record 123 rushing touchdowns, and was elected to six Pro Bowls over the course of his career. Allen was the first NFL player to gain more than 10,000 rushing yards and 5,000 receiving yards during his career. Allen is considered one of the greatest goal line and short-yard runners in National Football League (NFL) history. His younger brother, Damon Allen, played quarterback for 23 seasons in the Canadian Football League, was named to the Canadian Football Hall of Fame in 2012 and was professional football's all-time leader in passing yards. Allen has the distinction of being the only player to have won the Heisman Trophy, an NCAA national championship, the Super Bowl, and be named NFL MVP and Super Bowl MVP. He has been inducted into both the College Football Hall of Fame and the Pro Football Hall of Fame. Allen played football at Abraham Lincoln High School in San Diego, California, where he played the quarterback and safety positions. Watching Allen in the 1977 CIF Title game against Kearny High School (San Diego, California), one saw the emergence of a superstar. Allen led the Lincoln team to a 34-6 victory, scoring five touchdowns, including one after intercepting a pass. Allen rushed for 195 yards. Allen played running back with the University of Southern California (USC) from 1978 to 1981. He was recruited as a defensive back, but head coach John Robinson switched him to tailback. As a freshman in 1978, Allen was a member of the Trojans' National Championship team (as recognized by the coaches poll), playing as a backup to eventual Heisman Trophy winning running back Charles White. In 1979, he was moved to fullback. Eventually, in 1980, Allen became the starter at tailback and rushed for 1,563 yards, the third-most in the nation that year (behind George Rogers of S. Carolina - 1,781 yards and Herschel Walker of Georgia - 1,616). In 1981, Allen rushed for 2,342 yards, becoming only the second player in NCAA history to rush for over 2,000 yards in one season, passing the 2,000 yard mark in a win at Cal. He also gained a total of 2,683 offensive yards, led the nation in scoring, and won the Heisman Trophy, the Maxwell Award, and Walter Camp Award. He was also the Pac-10 Player of the Year. Allen shares the NCAA record for most 200-yard rushing games with Ricky Williams and Ron Dayne, each completing the feat twelve times. Allen finished his four college seasons with 4,664 rushing yards, 5,232 total yards, and 46 touchdowns, while averaging 5.2 yards per carry. USC has retired his jersey #33. 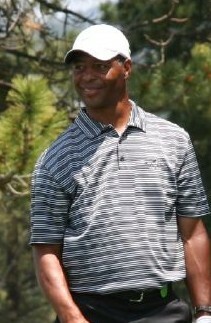 Allen was drafted with the 10th overall selection of the 1982 NFL Draft by the Los Angeles Raiders. Allen was pleased that he didn't have to travel as the team had just relocated from Oakland. Allen has recalled that shortly before being drafted the Raiders asked him his weight (he answered 200 or 212) and then drafted him soon after. Though his rookie season was shortened by a league strike, Allen rushed for 697 yards and led the Raiders to the best record in the AFC at 8-1. He was voted the NFL Offensive Rookie of the Year. The Raiders lost to the New York Jets in the AFC Divisional Playoffs. The next season, Allen broke the 1,000-yard mark for the first time, an accomplishment he would repeat the two following years. 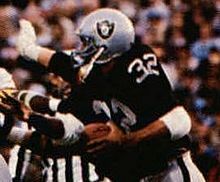 During the 1985 season, he rushed for 1,759 yards and scored 11 touchdowns on 380 carries, leading the Raiders to a 12-4 record and the AFC West Division Championship. In addition, Allen was named the NFL MVP. In Super Bowl XVIII on January 22, 1984, Allen ran for 191 yards, caught two passes for 18 yards, and scored two touchdowns in the Raiders' 38–9 victory over the Washington Redskins. Included in his stats was a 74-yard touchdown run, a feat that remained the longest run in Super Bowl history until Willie Parker's 75-yard run in Super Bowl XL. Allen's 191 rushing yards were also a Super Bowl record, which stood until Timmy Smith of the Redskins topped it with 204 yards in Super Bowl XXII. Upon winning the game, Allen joined a small group of players to win both the Heisman Trophy and Super Bowl MVP (Roger Staubach, Jim Plunkett, and later Desmond Howard). On January 1, 1984, Allen gained 121 yards for two touchdowns on just 13 carries against the Pittsburgh Steelers. One week later, he rushed 25 times for 154 yards and scored on a touchdown reception. In total, Allen rushed 58 times for 466 yards and four touchdowns during the playoffs. He also added 118 yards and one touchdown on 14 receptions. From 1987 through 1990, Allen shared the backfield with Bo Jackson. Initially, Allen was commended for his gracious nature and team spirit for sharing the spotlight during the prime of his career . In later seasons with the Raiders, Allen had a stormy relationship with owner Al Davis stemming from a contract dispute; Davis referred to Allen as a "cancer to the team." He also missed most of the 1989 season with a knee injury. Allen was relegated to back-up duty in his final three seasons with the Raiders and, at one time, fell to fourth on the depth chart. Allen's strained relationship with Davis reached an all-time low in December 1992. During halftime of the Raiders-Dolphins game on Monday Night Football, a taped interview between Al Michaels and Allen was broadcast in which Allen said that Davis "told me he was going to get me", adding, "I think he [Davis] tried to ruin the latter part of my career, tried to devalue me. He's trying to stop me from going to the Hall of Fame. They don't want me to play." Allen eventually left Los Angeles and joined the Kansas City Chiefs in 1993. Although he only rushed for 764 yards that year, he scored 12 touchdowns, leading the AFC, as he and Joe Montana led the Chiefs to the AFC Championship Game. Allen scored touchdowns in both Chiefs playoff games that year, and was named the NFL Comeback Player of the Year by the Pro Football Writers Association. With the retirement of Eric Dickerson in 1993, Allen became the active leader in career rushing yards, a position he maintained until being passed by Barry Sanders in Game 1 of 1997. Allen went on to play for the Chiefs for four more seasons, leading the team in rushing every year but his last. Allen retired after the 1997 season. In 1999, he was ranked 72nd on The Sporting News' list of the 100 Greatest Football Players. Allen was inducted into the Pro Football Hall of Fame in 2003. In 1999, Allen was also inducted into the San Diego Hall of Champions Breitbard Hall of Fame. In 1986, Allen met Kathryn Edwards and the two later got engaged. They married in 1993 at O. J. Simpson's Rockingham estate. Allen and Edwards' engagement was mentioned in Faye Resnick's book, Nicole Brown Simpson: The Private Diary of a Life Interrupted, which was published during Simpson's murder trial. Resnick claimed Nicole Brown Simpson was having an affair with Allen and Edwards was aware of Allen's womanizing ways and if she knew of the affair she would have to call off the wedding. The couple was asked to testify in the trial but fought the subpoena as they wanted to stay out of it. The couple divorced in 2001. ^ "Marcus Allen". Pro Football Hall of Fame. Pro Football Hall of Fame. Retrieved May 11, 2009. ^ San Diego Union-Tribune, February 3, 2014. ^ a b c d e f g h i Jensen, Jeffry (2002) . Dawson, Dawn P (ed.). Great Athletes. 1 (Revised ed.). Salem Press. pp. 42–45. ISBN 1-58765-008-8. ^ "1981 USC Trojans". TotalFootballStats.com. Retrieved August 1, 2012. ^ Harvey, Harvey (2002). The Super Bowl's Most Wanted: The Top 10 Book of Big-Game Heroes, Pigskin Zeroes, and Championship Oddities (1st ed.). Brassey's, Inc. p. 123. ^ "Marcus Allen Game Logs". Pro-Football-Reference.com. Sports Reference. Archived from the original on July 25, 2008. Retrieved May 11, 2009. ^ Gay, Nancy (August 4, 2003). "Raiders Notebook: Classy Allen has the last word on his day". SFGate. Hearst Communications. Retrieved May 11, 2009. ^ "Allen relegated to back up duty". Football.com. Football.com. Archived from the original on September 5, 2008. Retrieved August 19, 2008. ^ "Pro Football: Raiders' Allen Irked at Davis". The New York Times. December 15, 1992. Retrieved May 11, 2009. ^ "Marcus Allen". HickokSports.com. Ralph Hickok. February 18, 2009. Archived from the original on January 25, 2013. Retrieved May 11, 2009. ^ "LT TOPS BREITBARD HALL OF FAME CLASS OF 2015". San Diego Hall of Champions. 2015. ^ "We Are the Champions, of San Diego". San Diego Hal of Champions. September 18, 2014. ^ "Marcus Allen". OPEN Sports. OPEN Sports Network. Retrieved May 11, 2009. ^ "Marcus Allen". Football-Reference.com. Retrieved August 1, 2012. ^ "Erika Girardi and Kathryn Edwards Join The Real Housewives Of Beverly Hills". Broadway World. November 5, 2016. Retrieved September 9, 2016. ^ Spargo, Chris (June 16, 2016). "Nicole Brown Simpson DID have affair with OJ's best friend Marcus Allen and detailed it in her diary - and Simpson 'threatened to kill his wife if she saw him again one month before her death'". Daily Mail. Retrieved September 10, 2016. ^ Segura, Megan (January 26, 2016). "A Deep Dive into the Kathryn vs. Faye Feud". Bravo. Retrieved September 10, 2016. ^ Rosenfeld, Laura (February 24, 2016). "Does Kathryn Edwards Think O.J. Simpson Did It?". Bravo. The Daily Dish. Retrieved September 10, 2016. ^ "Bravo Media Blings Back an All New Season of "The Real Housewives of Beverly Hills" Premiering Tuesday, December 1 at 9PM ET/PT". The Futon Critic. November 5, 2015. Retrieved September 9, 2016. ^ Weigle, Lauren (January 19, 2016). "Kathryn 'Kate' Edwards on 'Real Housewives of Beverly Hills'". Heavy. Retrieved September 10, 2016. Wikimedia Commons has media related to Marcus Allen. "Marcus Allen: Pro Career". Kansas City Chiefs. 1997. Archived by the Wayback Machine.